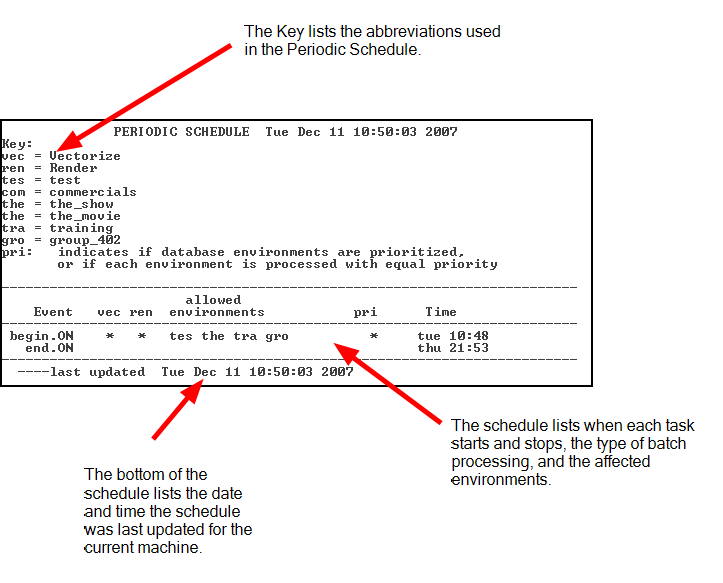 After you display the Periodic Schedule, you can modify it to change the time, type of batch processing, or environments to process. For more information on modify the Periodic Schedule using the Setper command, see Setting a Periodic Schedule. You can only display the Periodic Schedule for one machine at a time. 1. Type Showper in a Linux shell and press [Enter]. The system prompts you for the machine whose Periodic Schedule you want to view. 2. Type the name of the machine for which you want to define a Periodic Schedule. If you press [Enter] without specifying a machine, the command uses the machine name that appears in brackets.